AKRON, Ohio – Rewind back to the beginning of the decade. In 2001, the Pittsburgh basketball team had not made the NCAA Tournament since 1993 and was looking like a middling Big East program. On the other hand, Connecticut was only a couple of seasons removed from a national championship and seemed like the flag-bearer for the Big East. The programs have switched. Pittsburgh has made nine consecutive NCAA Tournaments, winning at least one game in eight of them. On the other hand, Connecticut has advanced past the first round of the Big Dance once in the past four seasons, failing to reach the NCAA Tournament twice. Now, Pittsburgh is looking to continue its winning ways as one of the Big East favorites, while Connecticut needs to bounce-back from a disappointing NIT campaign. Connecticut point guard Kemba Walker will need to lead the Huskies’ turnaround, as they lose three starters and return only four players who saw double-digit minutes last season. The New York native is confident that Connecticut will be better than a season ago, despite the loss of talent. The bad news for the Huskies did not end with the season, as rumors swirled about head coach Jim Calhoun retiring and then the NCAA accused the program of eight violations. Walker said it would not affect the team next season. Luckily, the Huskies’ five-man recruiting class remained intact, and they even added German swingman Niels Giffey in mid-June. Walker is excited about the potential of the newcomers, especially his future backcourt partner. “All of them [are looking good],” he said. “Roscoe [Smith]’s not there (on campus) yet, but the rest are. Shabazz [Napier], he’s going to get a lot of minutes. When he’s on, woo, we’re going to give him the ball. And when I’m on, they’ll get me the ball. We can definitely [co-exist]." 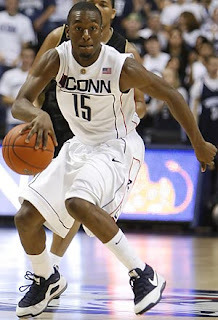 During his first two seasons at Connecticut, Walker deferred to upperclassmen: A.J. Price, Jeff Adrien and Hasheem Thabeet as a freshman, Jerome Dyson and Stanley Robinson last season. Next year, though, the team completely belongs to Walker. He will need to be the point guard, the scorer and the young Huskies’ leader. Another Big East player looking to expand his role will be Pittsburgh big man Gary McGhee. 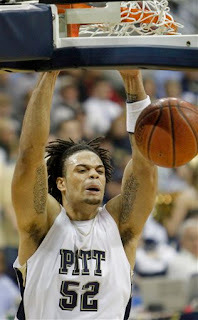 Unlike Walker and the Huskies, though, Pitt loses only Jermaine Dixon from last season’s NCAA Tournament team. Pittsburgh did not have high expectations going into last season, but surprised everyone and finished tied for second in the conference. McGhee thinks they can be even better this year. The Panthers head to Ireland later this month for a six-game foreign tour, and as a result, have been able to practice as a team since late June. When perusing the list of college players at the LeBron James Skills Academy, McGhee’s name does not stand out – he’s mostly a banger and rebounder who scored in double-figures just eight times last season. However, if Pittsburgh is going to make a deep run in the Big Dance next season, he will need to produce more down low. McGhee said his two days at the Skills Academy have already helped him greatly. With most of the talent in the Big East going to the NBA or graduating, the common perception around the country is that the conference will be down and not as strong as recent seasons. If Walker can help turn Connecticut around and McGhee leads another impressive season at Pittsburgh, the pundits could be wrong. This article was originally posted at the NBE Basketball Report.